With the kids back to school, it means that I probably should make more of an effort to make dinner. The summer days where I can just write “fend” on the menu board and walk out of the kitchen are behind me for this year. While I do my best to plan my meals, sometimes I just need something quick and easy. This Potato Pizza recipe fits the bill nicely. Pillsbury’s Refrigerated Pizza Dough (and their Crescent Roll Dough) are things I regularly keep on hand. 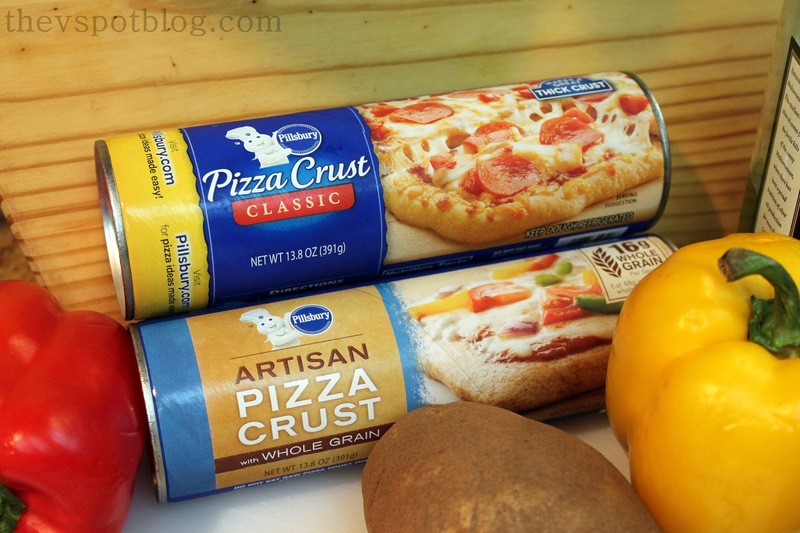 I keep both the regular crust and the artisan whole grain pizza crusts on hand. Both are delish! Those nights when you realize you’re going end up just opening up a couple cans of soup? It’s super easy to whip up a savory, hearty pizza or flatbread to go alongside it. 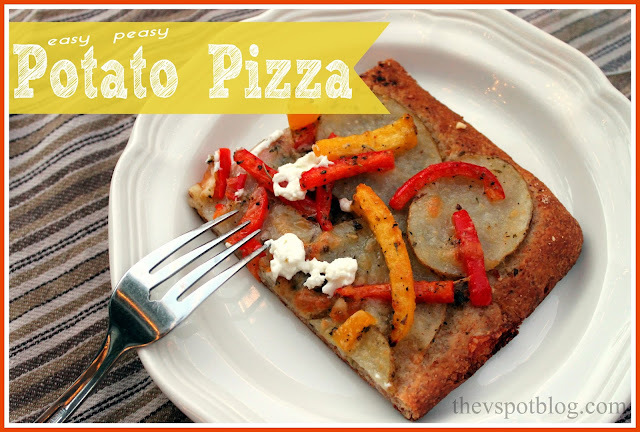 In this particular case, we had some tomato soup accompanied by this yummy Potato Pizza. No measurements here, because making pizza isn’t a science, it’s an art. Do what you want and how much you want. That’s part of pizza’s beautiful simplicity. Start by slicing your potatoes very, very thin. If you have a mandolin, now is the time to use it. If you don’t, do the best you can. 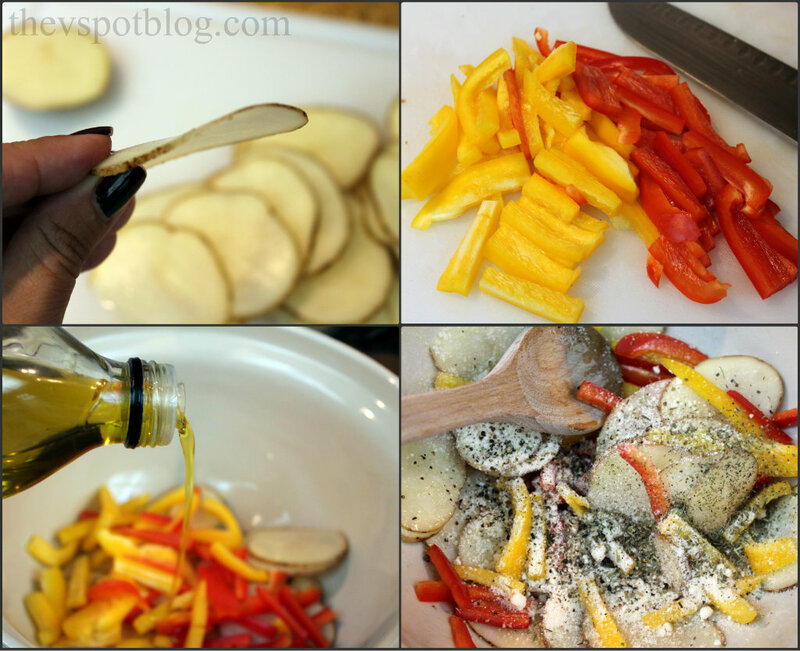 Slice and chop your peppers (I used half of a red and half of a yellow) then put the potatoes and peppers in a bowl and drizzle with olive oil. Toss to coat, then add in grated Parmesan Cheese, salt & pepper and any other seasonings you might want. I sprinkled in a healthy amount of Italian Seasoning blend. Totally optional, but I happen to think that a little bit of Italian anything makes everything better. I have an irrational fear of these pop open cans. If you are ridiculous like me, have someone open the can for you. Otherwise, be normal and open the can of pizza crust yourself. Unroll the dough onto an greased cookie sheet. Stretch the dough to reach all sides of the cookie sheet, then take a dollop of basil pesto (about 1/4 cup) and spread evenly over the dough. Place the potato slices in an even layer over the top of the pizza, then add the peppers on top. This is actually pretty easy to do, even though they were tossed together. I just do this by hand. Over the top of the potatoes and peppers, sprinkle on a bit more Parmesan Cheese and then lightly sprinkle on some shredded Mozzarella. Bake at 425 for 10 – 15 minutes. When the crust seems done and the cheese is starting to brown, crank on the broiler for about 2 minutes. Remove the pizza and immediately add a little crumbled goat cheese, if that was in your plans. How about you? What makes an ordinary weeknight dinner a bit more interesting at your house? 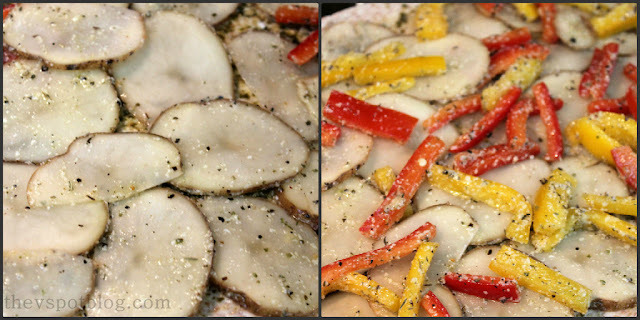 Pizza crust that’s deliciously easy! Unroll, bake and enjoy in minutes. Pillsbury pizza crust, it’s the perfect canvas for your favorite toppings. For some more easy dinners, courtesy of those scary pop open cans, check out my recipes for The Circle Sandwich and Bacon Blue Cheese Chorizo Bites, which both use Crescent Roll Dough. 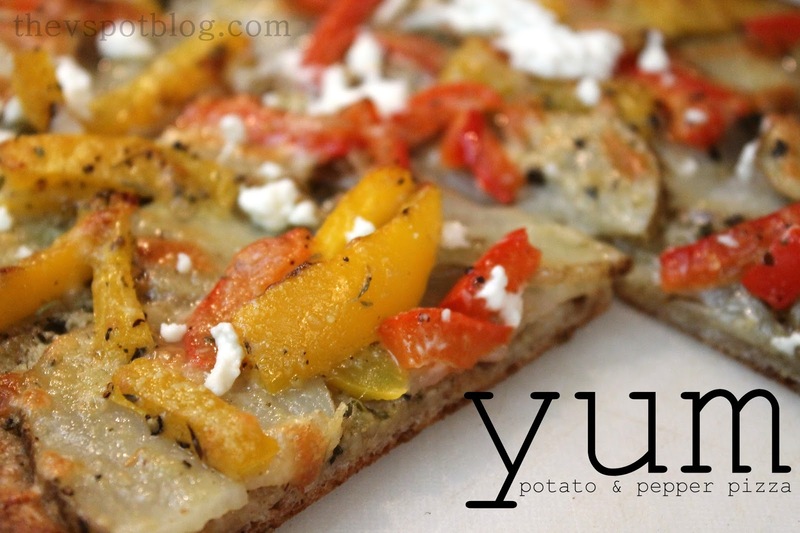 this looks so good, I have never put potatoes on pizza!